Bob Kauflin has some thoughts about how the IPod is a blessing, and a curse. As someone who is living in 2001 (I just got a flash MP3 player from my sister-in-law) I am more of an observer. We can thank God for the blessings, even as we watch our hearts for evidence of the curse. “I have always considered with Luther and Calvin that the sum and substance of the gospel lies in that word substitution- Christ standing in the stead of man. The gospel is this: I deserve to be lost forever; the only reason why I should not be damned is that Christ was punished in my stead, and there is no need to execute a sentence twice for sin. “I cannot enter heaven without a perfect righteousness: I am absolutely certain I shall never have one of my own. But, then, Christ had a perfect righteousness and he said, ‘There, poor sinner, take my garment and put it on; I will suffer in your stead, and you will be rewarded for the works you did not do, but which I did for you. '” Charles Haddon Spurgeon, as quoted in The Shadow of the Broad Brim. More from Confessions of a Reformission Rev. Soon Mars Hill became a stench in their neighbors’ nostrils. The congregation had outgrown the facility, so parking problems erupted. The loud music on Sundays created additional issues with the neighbors. An even bigger problem loomed- the 150 barrier. I’ve seen this in effect in churches of which I was a member. 150 is a tough barrier to break, and it has something to do with how we are made. There is a limit to the number of folks the average guy can relate to. And that number is …. 150. So in his attempt to overcome this obstacle, he went to 2 services (like many a pastor before him). As many other congregations before had done, they resisted. This is a familiar concept. Churches want to grow- just not too much. We want a village. We don’t want a church like a city- a large community of multiple smaller communities (neighborhoods). Driscoll tried to address this. Yes, some pastors are ambitous. But many long to see the advance of the gospel tangibly. Church growth is not an evil thing, though it can be pursued for wrong reasons, and wrong means. To artificially limit the growth of a church could be sinful. It is placing our preferences above what God may choose to do. I didn’t see Him asking the early church how they felt about Him adding 3,000 to their number in one day, or the continual growth thereafter. They rejoiced! And so should we. The Patriarch of the Celtics clan passed away from a heart attack Saturday, October 28th. He was the architect of 16 NBA titles, 9 as coach and 7 as GM. Red also broke the color barrier, repeatedly. He was the first to draft a black player. He was the first to have 5 black starters. He was the first to hire a black head coach- Celtics legend & dear friend Bill Russell. He pulled off some of the biggest, best trades in NBA history. It is hard to believe that a man you’ve never met can be such a big part of your life. As a native New Englander, I grew up longing to see Red light up another victory cigar. As such, it was only appropriate to enjoy a Maria Mancini on the back porch last night. I did not find out about his death until I went to the office Sunday morning to edit my sermon. You knew it was coming, but still…. it is like a member of the extended family died. Red and his gifts brought joy to so many. His influence on me is seen on my sig for Celticsblog.com. It is today’s Pensee for the Day. “The most important thing is the ability to communicate. It’s not how much you know. It’s how you communicate what you know.” Arnold “Red” Auerbach, a giant among giants. I just listened to Mark Driscoll’s sermon from the Desiring God national conference. WOW! What a great sermon, a necessary sermon. He talks about the need for both the incarnational and the exalted Jesus. Without the exalted Jesus, the incarnational Jesus lacks authority. Without the incarnational Jesus, we don’t have a Great High Priest who is able to sympathize with us. We need both. He talked about the need to contend for the Gospel and contextualize the Gospel. He listened 9 essential doctrines we need to contend for in the postmodern world. In the process he takes on the emergent conversation. Having contended for the faith, we must also speak timeless truth to a particular culture. To do so, we must contextualize it. Part of the proof of contextualization is the reality of the 4 Gospels- 4 different culture groups. I just read 2 Timothy this morning. Paul suffered all things for the sake of the elect. We must be willing to do all things permissible to bring the gospel message to the elect, regardless of their culture instead of expecting them to meet you on your cultural turf. So… move on over to Desiring God ministries and drink this one often. 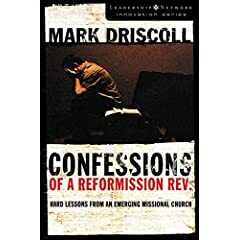 More about Confessions of a Reformission Rev. You don’t need to have a church of 75-150 to need a cup. Lately Satan has been ‘showing’ up, and I’ve been brought to my knees trying to catch my breath. I have to keep reminding myself that what Satan intends to destroy or discourage, the Father intends for His glory by revealing the power of the Gospel. There sure what alot God intended for Mars Hill and Mark Driscoll in this phase. Here it gets uncomfortable if you are a cessationist. Some, but not all of this, would fit into the proposal by Wayne Grudem in The Gift of Prophecy. Beyond that, I guess the way I’d skim that would be to say that what God “said” to Mark is not binding on all of us, but merely fitting to the situation in which he found himself. There have been experiences I’ve had that I can’t explain. But Mark was glad that God did not abandon him, because it was really hitting the fan. First, an older, mentor-type guy tried to take over the church. Unknown to Mark, until later, he’d done this before. Then large parts of the music team fell under the influence of revisionist, postmodern theology which characterizes the emergent branch of the movement. One of the most talented teachers also drank from the reconstructionist stream and dragged a bunch of people to a mystical RC church and new age meetings. Then were the people who wanted him and his wife to spend all day with them. I finally got around to the message Donald Miller gave at Mars Hill (Grand Rapids). [quick complaint- why do they keep the announcements? i can’t fast forward on the old MP3 player] It was more like a lecture… not really much work with a text of Scripture. But he did say some really good things. He focused on Christianity as relationship, not a system of ideas. Yeah, we can get too focused on the theology. But… theology is essential to knowing who the God we know is, and how we come to know Him and …. Theology is not optional. And I don’t think he’s saying it is, just reacting to those who study, study, study but don’t actually know God. He starts by talking about the Magic Bullet, one of those food prep devices on an infomercial. He uses this as a metaphor for how consumerism views God. We get caught up on formulas and all kinds of things. But God is a Father to us who believe. As such, we does what is best for us rather than what we want or think is best for us. I’ve been gaining a new appreciation for that as a father myself. She doesn’t care about what is best for her, only that she wants something and I’m not coming through. After listening to this at the gym, I was thinking about my own father and how that relationship makes my relationship with the Father difficult at times. I can lapse into a functional relationship, finding intimacy so hard- mirroring the earthly one. And I try hard to make Him proud of me. But you see, He loves & accepts me in Jesus… so such machinations are really a waste of time. In those moments I’m living like Jesus doesn’t matter- and not much could be more sinful. I am a lousy son… but I am His son- all because of Jesus.